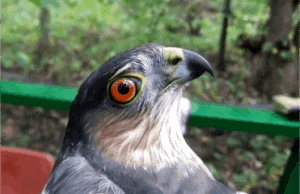 AHY Sharp-Shinned Hawk. Photo by Sachiko Schott. Strong winds and overcast skies made for a slow start to the month: some Swainson’s Thrushes, Hermit Thrushes and Grey-Cheeked Thrushes were banded, but not in large numbers. A few warbler species were seen, and several Black-Throated Blue Warblers and Ovenbirds were banded on occasion. Western Palm Warblers and Myrtle Warblers began to show up more frequently. Twelve different warbler species were observed on October 8th, including the first Orange-Crowned Warbler of the season. Interestingly, it already had a band – but while the warbler lingered close to the nets, it never came close enough to be captured, and where it was banded and when will have to remain a mystery! Sparrows had more of a presence this month – many White-Throated Sparrows were banded, and flocks of them were often seen and heard around the netting area. The first Swamp Sparrow was sighted on October 2nd, and on October 10th hundreds of sparrows were seen on the west beach of Fish Point, including the first Clay-Coloured Sparrow and Eastern Towhee of the season. A Field Sparrow was banded as well, an unusual capture as they usually prefer open fields. White-Crowned Sparrows have become more common, and the first Fox Sparrows for the fall were banded on October 11th. The first Golden-Crowned Kinglet was observed on October 1st. From there, numbers fluctuated but they remained a constant on census and in the netting area, with large flocks moving through the netting area on October 9th and 12th. Fewer Ruby-Crowned Kinglets were seen (although equal numbers of Ruby- and Golden-Crowned Kinglets were banded on October 11th), and it is likely that their migration is almost over. Things began to pick up on October 9th, when 33 birds were banded of a wide variety of species, from warblers to thrushes to sparrows. Bird activity reached its zenith on October 11th, when 154 birds were banded of 16 species, PIBO’s highest banding total for the season! The majority of the birds captured were Hermit Thrushes (49), with White-Throated Sparrows coming in a close second (38). Large numbers of both species of kinglets were banded as well. For the most part, the birds did not stay on the island for long, and were quick to continue on their migration – only two of the Hermit Thrushes banded were recaptured the next day. October 12th was quieter, except for 31 Golden-Crowned Kinglets that were captured on a single net round. They made up the majority of birds banded for the day. By October 13th, the wind had picked back up and was coming from the south, and bird activity had slowed back down. A few waterfowl species have been observed on census, although the bulk of them will be migrating later in the fall: seven Red-Breasted Mergansers were seen over the lake on October 6th, and three Horned Grebes were observed on census on October 9th, but large numbers of ducks have yet to appear. Some shorebirds are still around, including a group of 17 Sanderlings and a Spotted Sandpiper seen on October 4th and five Killdeer observed on October 15th, but for the most part their migration has ended.